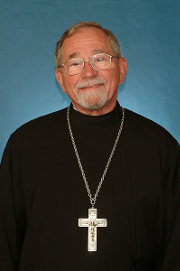 Protopresbyter Thomas Hopko, Dean Emeritus of Saint Vladimir’s Orthodox Theological Seminary, Crestwood, NY, and noted Orthodox Christian priest, theologian, preacher, and speaker, fell asleep in the Lord on the afternoon of March 18, 2015. Father Thomas was the beloved husband of Matushka Anne [Schmemann] Hopko. They were married on June 9, 1963. Together, Father Thomas and Anne are the parents of five children, sixteen grandchildren, and three great-grandchildren. Thomas John Hopko was born in Endicott, NY, on March 28, 1939, the third child and only son of John J. Hopko and Anna [Zapotocky] Hopko. He was baptized and raised in Saint Mary’s Carpatho-Russian Orthodox Greek Catholic Church and educated in Endicott public schools, graduating from Union-Endicott High School in 1956. Beginning in 1968, Father Thomas began his long service to Saint Vladimir’s Orthodox Theological Seminary. Over the years, Father Thomas held the following positions: Lecturer in Doctrine and Pastoral Theology, 1968–1972; Assistant Professor of Dogmatic Theology, 1972–1983; Associate Professor of Dogmatic Theology, 1983–1991; Professor of Dogmatic Theology, 1991–1992; Dean, Rector of Three Hierarchs Chapel, and Professor of Dogmatic Theology, 1992–2002. During his years of priestly ministry, Father Thomas authored numerous books and articles. Most well known of these publications is The Orthodox Faith: An Elementary Handbook on the Orthodox Church. A prolific speaker and preacher, he spoke at conferences, retreats, public lectures, and Church gatherings of all kinds, many of which were recorded. Father Thomas performed countless duties on behalf of the Orthodox Church in America, including representing the Church at intra-Orthodox gatherings and ecumenical meetings. Upon retirement, Father Thomas and Anne moved to Ellwood City, PA, where they lived near the Orthodox Monastery of the Transfiguration, and Father Thomas began a new ministry: internet-based Orthodox Christian radio talks. Since 2008, Father Thomas had produced well over 400 podcasts for Ancient Faith Radio. Father Thomas exercised untiring and loving pastoral care on behalf many who sought him out for spiritual guidance. His greatest desire was that every person would respond to these words of Jesus Christ: “Come to me, all who labor and are heavy laden, and I will give you rest” (Matthew 11:28). Father Thomas is survived by his wife, Matushka Anne, and their five children: Archpriest John Hopko and his wife Macrina, of Terryville, CT; Juliana and husband Gregory Thetford, of Ellwood City, PA; Catherine and husband Raymond Mandell, of Clearfield, PA; Mary and husband Archpriest Nicholas Solak, of East Stroudsburg, PA; and Alexandra and husband Joseph Sedor, of Ellicott City, MD. He is also survived by two sisters, Mary Ann Macko of Endwell, NY, and Barbara McPherson of Sayre, PA and Frostproof, FL. Additionally, Father Thomas is survived by 16 grandchildren and three great-grandchildren, as well as many, many other dear relatives, colleagues, and friends. Funeral arrangements will be posted as they are received. Father Thomas’s family wishes to thank all those who ministered to him so lovingly during his long final illness. Special thanks are extended to Mother Christophora, Abbess, and the entire sisterhood of the Orthodox Monastery of the Transfiguration for their constant support and help, Archpriest Michael and Matushka Susanne Senyo; Protodeacon Michael Wusylko, M.D. ; and Good Samaritan Hospice. In lieu of flowers, memorial donations may be given to Saint Vladimir’s Orthodox Theological Seminary, Crestwood, NY; the Orthodox Monastery of the Transfiguration, Ellwood City, PA; Ancient Faith Radio and Good Samaritan Hospice of Concordia, Wexford, PA.